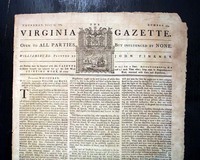 Many additional authentic issues are available with Colonial America content. 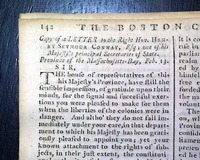 Those shown below are those issues published within the colonies. 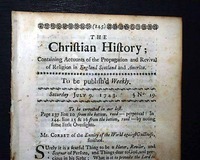 Select the "Colonial - British Included" tab if you want to include British titles with colonial content. 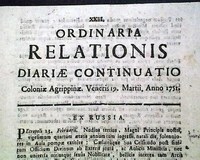 ORDINARIA RELATIONIS DIARIE CONINUATIO, Colonie Agrippinea, March 19, 1751 In 50 A.D. Roman emperor Claudius planted a colony on the left bank of the Rhine River. 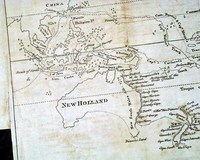 At the request of his wife he named it "Colonia Agrippina", which later became Cologne, Germany. 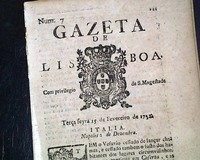 GAZETA DE LISBOA, Lisbon, Portugal, February 15, 1752 A small-size newspaper of 8 pages, this being issue number 7. 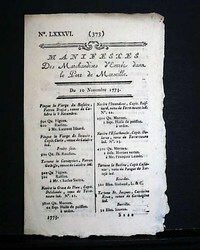 Presumably entirely in Portuguese. 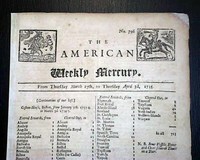 Measures 6 by 8 inches, very nice condition. 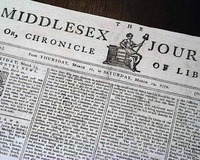 Handsome engraving of a coat-off-arms on the front page. 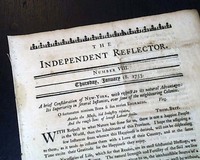 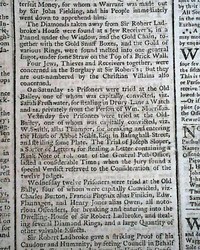 THE INDEPENDENT REFLECTOR, New York, January 18, 1753 This rare newspaper lasted for less than one year, publishing but 52 issues. 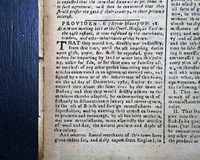 Primarily moral and political essays, it gave offense to men in power and was "suppressed by authorities", as Brigham relates. 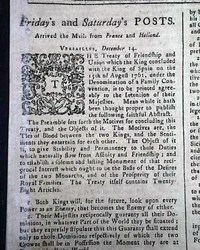 BERROW'S WORCESTER JOURNAL, England, Jan. 14, 1762 Nearly half of the front page is taken up with the details of: "The Treaty of Friendship & Union which the King concluded with the King of Spain on the 15th of August, 1761..." with the 28 Articles included. 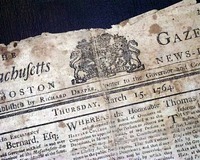 THE MASSACHUSETTS GAZETTE & BOSTON NEWS-LETTER, March 15, 1764 the front page has: "A PROCLAMATION" for postponing the General Court. 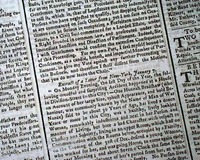 Various news reports and ads inside. 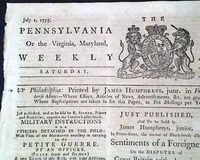 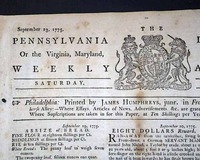 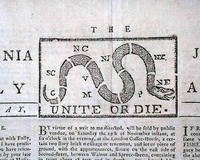 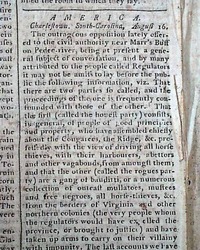 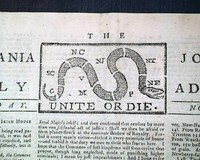 The publisher of this newspaper had Loyalist leanings, causing its demise before the formal outbreak of the Revolutionary War. 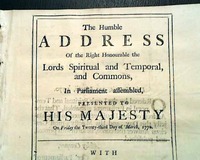 "The Humble ADDRESS Of the Right Honourable the Lords Spiritual & Temporal, & Commons...Presented To HIS MAJESTY On Friday the 23rd Day of March, 1770 With His Majesty's Most Gracious Answer." 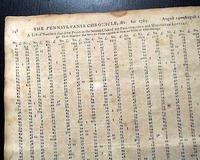 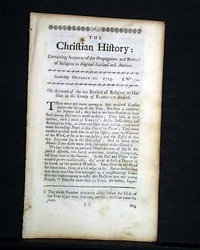 This is a four page pamphlet measuring 8 1/4 by 11 inches with wide margins and in great condition. 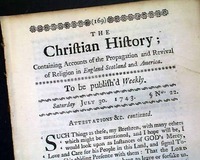 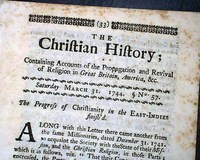 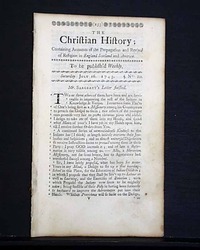 A displayable full title page. 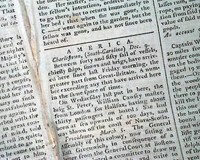 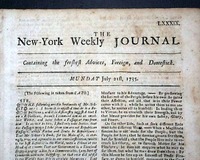 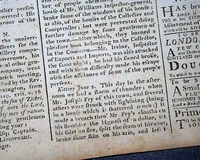 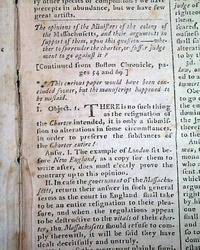 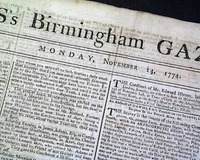 ARIS'S BIRMINGHAM GAZETTE, England, March 11, 1771 The front page has an: "Extract of a Letter form New York" with an interesting report of a tragedy (see). 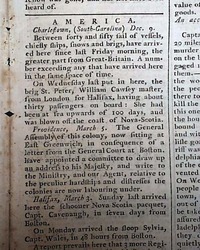 Page 2 has a letter form Newport, Rhode Island (see). 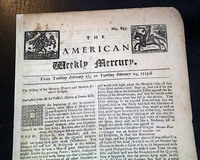 Four pages, minor archival mend inside, very nice condition, folio size. 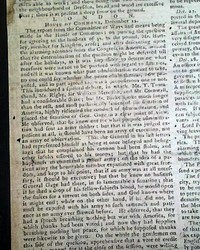 ARIS'S BIRMINGHAM GAZETTE, England, June 17, 1771 Page 2 has a very brief Judaica item: "...In the attack Marshal Sawa was wounded...To escape the Russians, he was put into a great basket & carried into a marshy place...having agreed with a Jew to come and dress his wound, who was to find his way to him..." (see). 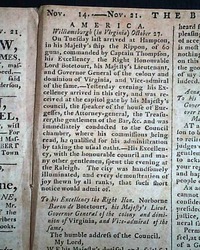 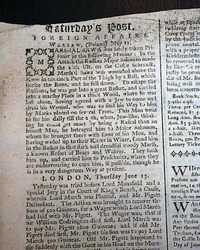 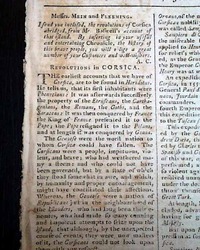 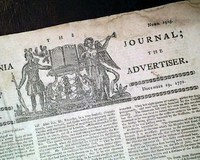 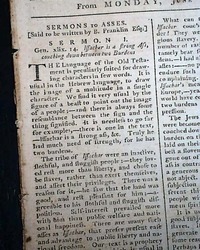 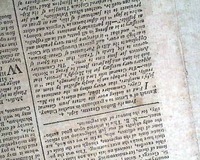 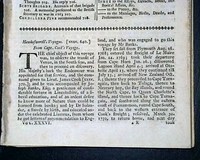 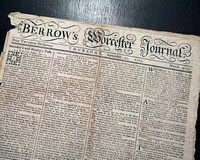 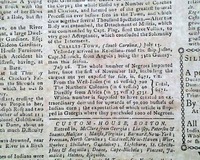 BERROW'S WORCESTER JOURNAL, England, Sept. 23, 1773 A typical newspaper of the day with ornate lettering in the masthead. 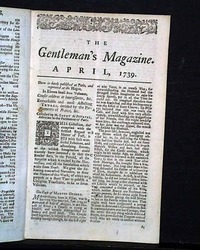 Certainly one of the less common 18th century titles. 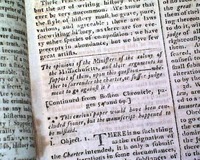 Four pages, various wear at the margins, a bit irregular at the spine, red inked tax stamp on the ftpg. 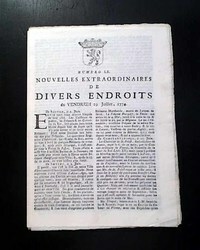 Although in French it was not printed in France but rather at Leide (now Leiden), Holland by French refugee Etienne Luzac. 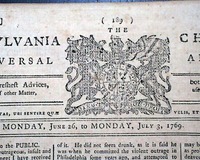 It was a successful newspaper and boasted a sizable readership in America. 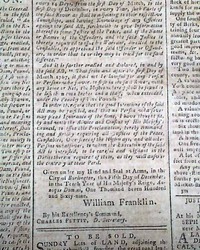 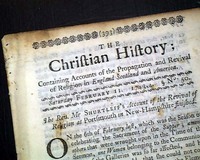 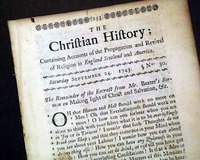 A great single sheet "Extra" which contains a wealth of notable news from both America and England on the on-going troubles between America and England including prophetic comments inferring to a coming war.